The Catholicosate was astir this morning with news that His Eminence Archbishop Ghevont Tchebian, known here as Ghevont Serpazan (”serpazan” refers to a bishop) the former Primate of Syria, passed away early this morning, around 4 a.m. local Lebanese time. 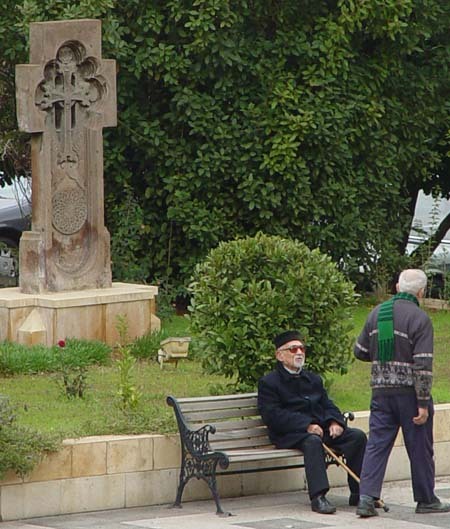 The senior member of the Brotherhood of the Catholicosate of Cilicia, Archbishop Ghevont was 95 years old and the dean of all Armenian bishops, both in age and in length of years in the order of bishop. He was also one of the last remaining survivors of the Armenian genocide, fleeing to Damascus from his native Istanbul with his family as a small boy. Ghevont Serpazan’s funeral with the “last annointing” is scheduled for tomorrow morning (Friday, March 10) at 10 a.m. The Deacons from the seminary will sing for the service.